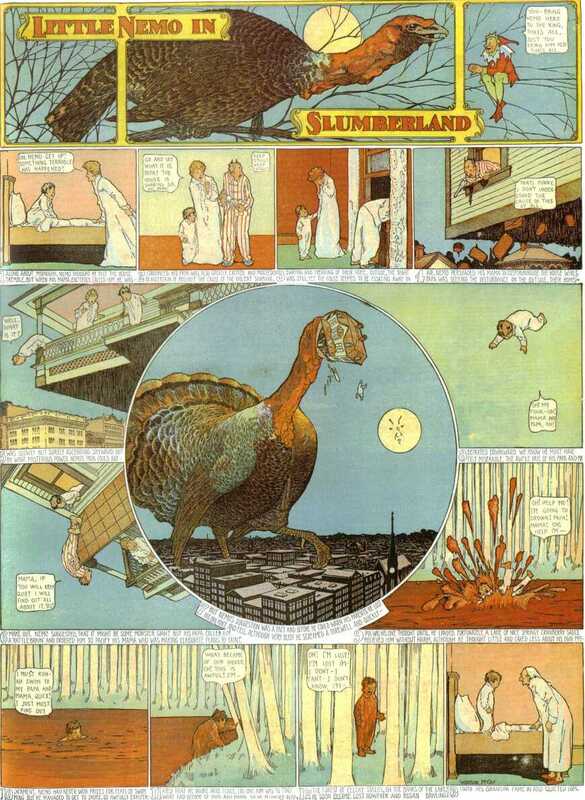 Many readers are no doubt already familiar with Winsor McCay’s classic comic strip, Little Nemo in Slumberland. But, if you’re not, they basically involve a young boy embarking on journeys into various dream realms. McCay created these dynamic, wildly colorful, 22” x 17” full-page comic strips during the first two decades of the twentieth century. 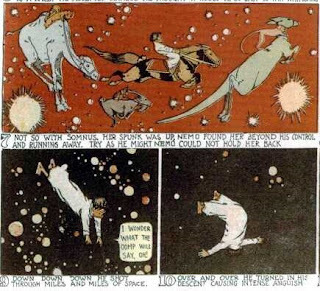 And his work has influenced a great many comics creators, as well as filmmakers and children’s book authors (many kids are first introduced to Little Nemo unknowingly through Maurice Sendak’s homage to McCay, In the Night Kitchen). So I decided to set us up with this thoughtballoons prompt—to write a dream-based comic in the spirit of McCay’s Little Nemo strips—for two reasons. First, I thought it’d be fruitful to muck about inside the mechanics and imagination of McCay’s storytelling. A hundred years ago, McCay was confronting challenges of sequential art with which contemporary creators still wrestle. How does each panel work on its own, while contributing to the full page’s visual integrity? How does the eye move between panels, and across the page, and what effect does this movement have on the reader’s imagination? Though his style evolved over the strip’s run, McCay had very particular rules that he worked out for himself—and I wanted to see what it was like to play (roughly) by his rules. Second, I thought it would be interesting to muck about with actual dream material. Everyone knows that telling someone else one of your dreams nearly always leads to a glazed, bored expression. Even if we can recognize certain shared concerns or anxieties, another person’s dreams are just too specific to her own subconscious—the hodgepodge of data drifting about in each of our strange mental landscapes. But when I was reading McCay’s strips, I was struck by how he seemed to have such a good grasp on the way dreams can work: the narrative logic used in some of McCay’s early strips seemed familiar to me. So, in putting forward this prompt to the thoughtballoons crowd, I wondered what would happen if we channeled one of our own dreams—in all its particularity and oddness—through McCay’s storytelling form. How much of a dream’s non-narrative nature can be kept intact as we translate it into a one-page story with a beginning, middle, and end? How do we write our memory of a dream for another artist — perhaps a stranger—to draw? The story should be in the spirit of McCay’s early twentieth-century strips: usually Nemo drifting off to sleep, finding his way into Slumberland (realm of dream and nightmare), with a final panel that interrupts the dream as Nemo wakes in bed, back in the real world. The idea here is to see what happens when you give Nemo one of your own dreams or nightmares to explore. If you like, as a bonus, mess about with McCay’s caption and dialogue style: he often included footer captions narrating each panel, plus dialogue. For reference, there are a bunch of the strips online, but here’s a handy glimpse at a few. This was extremely difficult, so I have no idea if I did this right. 1.1: Nemo and his wife get into bed. Imagine Nemo in his mid ‘30s, losing his hair, and clean-shaven. Both of them are wearing plaid pajamas. 1.2: They kiss. Nemo’s wife has close-cut brownish/black hair cut to chin level. Her smiling dimples are so sharp you could pop pop bottle caps off with them. 1.3: As if we’re on the THE FAN over their bed watching them as they curl off to sleep. We can see the slightest tease of the fan. Wife has a hand on Nemo’s shoulder. He’s sleeping on his back—staring up at the fan. 1.4: We’re in profile of Nemo’s eyes getting heavy. The digital clock on his nightstand shows 9:43pm. Perhaps a way we can show this is from a Profile Angle. This time, let’s say they are one quarter shut. We can see the edge of a wood night table in the corner of the frame. 1.5: We descend in to SLUMBERLAND: Nemo and his Wife are on a TOBOGGAN sliding into nothingness of the dream land. Nemo is a little scared; his wife, on the other hand, is having a blast. 1.6: From our heroes’ perspective: the edge of the Toboggan pointed directly between the yellow lines of a FROZEN ROAD. In between those yellow lines are TWO HEAD LIGHTS. 1.7: Nemo leans up out of bed, his eyes wide. His wife is mostly out of frame, her back is now turned to him and she seems as cozy as a baby in a bonnet. 1.8: He looks over at her and sees she’s sleeping like a baby. 1.10: Nemo is on the toilet. Next to his head is the sink. There’s a slight bubble of water dripping off the faucet. It’s there that the Sink’s speech balloon can go. 1.11: Nemo turns his head away from us and looks at the sink. NEMO: Did you just say “hey” to me? SINK: Yeah. You’re awake! It’s me, your brain. 1.12: Nemo looks up at us, as if asking us for answers. NEMO: No, come on, I’m not AWAKE. LEMME ALONE! This would actually work on a full newspaper-sized page. I'm pretty impressed with what you pulled off here with grown-up Nemo. Cool page.